Make and bake cake as directed on box for 13x9-inch pan. Cool 10 minutes; remove from pan to cooling rack. Cool completely, about 1 hour. For easier handling, refrigerate or freeze cake 30 to 60 minutes or until firm. Meanwhile, tint 2 1/4 cups of the frosting with food color as desired for your favorite team’s jersey color. Tint 1/2 cup frosting as desired for team name and numbers. Remove cake from freezer. Using serrated knife, cut rounded top off cake to level surface; place cake cut side down on cutting board. Place short side of cake toward you. Poke toothpick in cake at a point 4 inches from top and 1 inch from outside edge, on both sides. Poke toothpick in cake at bottom, 1 inch from outside edge, on both sides. Cut 1x8-inch piece (marked with toothpicks) from outer edge of each side. Cut each piece in half crosswise, forming 4 (1x4-inch) pieces. Cut neck hole from top of cake. On tray, place largest piece of cake. Using small amount of jersey-colored frosting, attach 2 small rectangular pieces on each side of top of cake to lengthen sleeves. Frost with a thin layer of frosting to seal in crumbs. Refrigerate or freeze 30 to 60 minutes to set frosting. Frost entire cake with jersey-colored frosting. 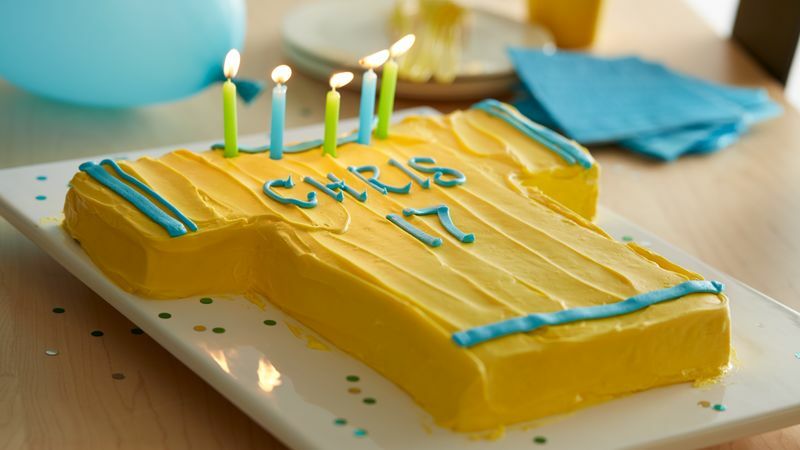 Pipe other color frosting onto cake to create team name, numbers and shirt trim. Store loosely covered.